I’m a little busy this month. You may have noticed some changes around here lately at Fancy Pants Foodie. And if you’ve been with me a while, it might look familiar. Back in 2009 when I started this blog, it was basically about what I cooked at home, teaching you how to do the same if you wanted. That morphed into my experiences at culinary school, and later I wrote quite a bit of local food industry news, often in awkwardly newsy style. With my release of arfoodjobs.com and its own blog, I’ve decided to publish all new industry-related stuff there. So if you’re in the culinary or hospitality business, you might want to check that out! And back here at FPF, we’re back to food news, reviews and how-tos that relate directly to the home cook. We’ll continue to have an emphasis on gluten-free cooking (since that’s what I do, duh). In the near future, I’m offering even more. In the works: A whole new site design, video-based instruction, gear recommendations and more. I’m also writing up some publications you’ve told me you’d like, such as an elimination diet guidebook and a seasonal, local gluten-free recipe book. This month is a great time to think new, bigger and better, because it’s conference season. I have THREE in the next few weeks! The first, this coming weekend, is Arkansas Women Bloggers University (#AWBU), a fabulous smallish event that has grown into a full-fledged blogger conference on par with just about any other of its size. For me, this one will be about the usual blog-improvement business, but even more so about learning to connect with other people, my local lady friends. Next is my favorite industry event all year, the Arkansas Hospitality Association Convention and Tradeshow! This includes the Culinary Classic, the live Iron Chef competition, on-site seminars (I’m teaching one on gluten free foodservice!) and loads of great freebies and contacts. And lastly, my big leap of faith, the International Food Blogger Conference by Foodista. 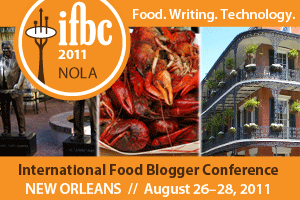 I went to one #IFBC event a few years ago in New Orleans and it was mind-blowing, in a different way from the others I’ve mentioned. It can be summarized in whom I ended up sitting next to at the round tables during sessions. One day, it was the lead food photographer for the New York Times. Another day, it was the author of the book we used in my Professional Food Writing course in culinary school. And that doesn’t even get into the high-end companies looking for partners, the generous swag and the amazing bloggers themselves…several of whom were “internet famous.” Everyone was very welcoming and willing to chat, which I understand is not always the case at these big blog conferences. I say that #IFBC is a leap of faith this year because it’s not just an easy drive to the Big Easy this time…it’s a flight to Seattle. I’ve never been there, and I don’t even know my roommate yet, other than a few messages online! But I know it will be great. Starting tomorrow at #AWBU’s Foodie Friday event, I’m ready to be inspired. Want to hear more about it? Follow me on the Twitters (@ARFoodie) or just search for the #AWBU hashtag. In today’s recipe writing session at the International Food Blogger Conference, Deb from Smitten Kitchen made a PB&J on stage. Our task, as directed by session moderator Diane Jacob (author of Will Write for Food), was to write a recipe from her demonstration. We had like five minutes to write it. This is a great exercise for anyone with a food blog. The best sandwich you always had. Lay out the super-bleached white bread so that the flat ends are facing each other. Using a butter knife and a momma’s tender hand, spread the jelly onto one piece of bread. Then wipe the knife and do the same with the peanut butter on the other piece. Don’t tear it! Gently! Place the pieces together and cut into triangles, rectangles, or quarters — whatever yo momma did. Eat in front of some after-school cartoons with a glass of cold milk.